Roasting a chicken is easy. That's why when you open my refrigerator, any day and any time of year, you are likely to find a roasted chicken there. If you are a regular reader here at Just One Donna, you know I'm all about food that is delicious, easy to prepare, and good for you. A roasted chicken fits all of those requirements. What's more, the leftovers will be great for additional meals during the week. This post contains affiliate links for your shopping convenience. I receive a small compensation when you shop with these links that support publishing this blog. 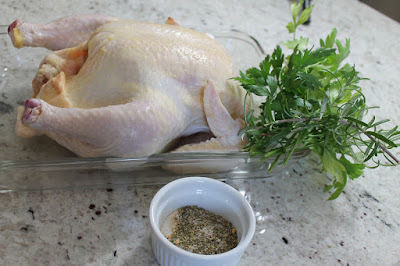 Getting into the habit of roasting a chicken every weekend is just good meal management for busy people. Having a roasted chicken in your fridge means you'll always have the start of a delicious meal ready to go. Leftovers are easily turned into a delicious chicken salad, chicken soup, chicken tacos, chicken pot pie, and more. Those grocery store rotisserie chickens are a good choice in a pinch, but I have found it is pretty hard to get one that isn't overcooked. I also find myself wondering what they might have injected the rotisserie chicken with as a flavor booster. I'd much rather have complete control over all things related to my roasted chicken. 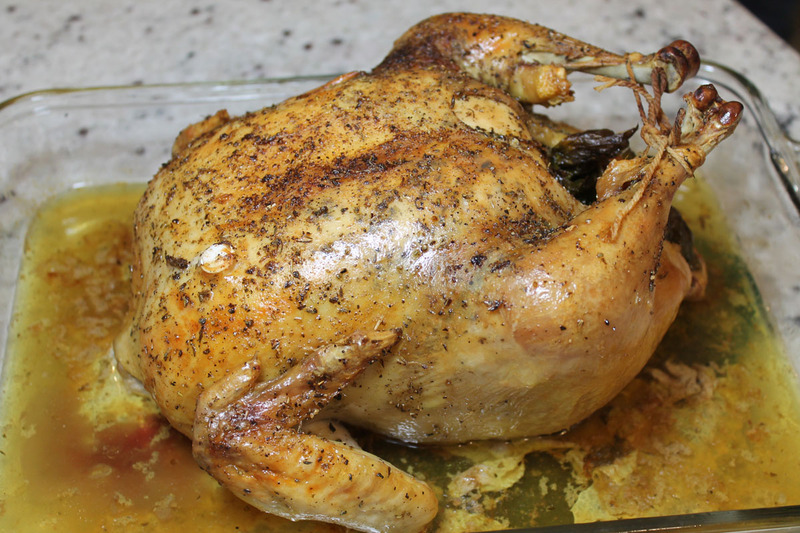 Roasted chicken recipes abound across the internet. You might wonder why I'm bothering to post my recipe. I hope this post will inspire you to start the habit of roasting your own chicken on a regular basis. 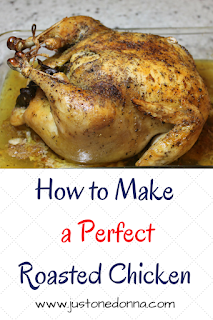 The key is to get consistently good at executing the basic technique and then make your roasted chicken recipe your own by customizing it to your personal preferences. Select a chicken that is about five pounds in weight. You can buy them smaller or larger, but a five-pound chicken roasts well, doesn't take too long to cook, and has enough meat on the bones for a family dinner. Use a roasting pan that is easy to clean. I've settled on glass or ceramic 13x9-inch baking dishes as my favorite pans for roasting chickens. Choose an oven temperature that works for you. You can roast a chicken at 350 degrees F, or 375 degrees F, or 400 degrees F. I like 400 degrees F because it produces a roasted chicken with a browned, crispy skin every time. A lower temperature will extend the cooking time. 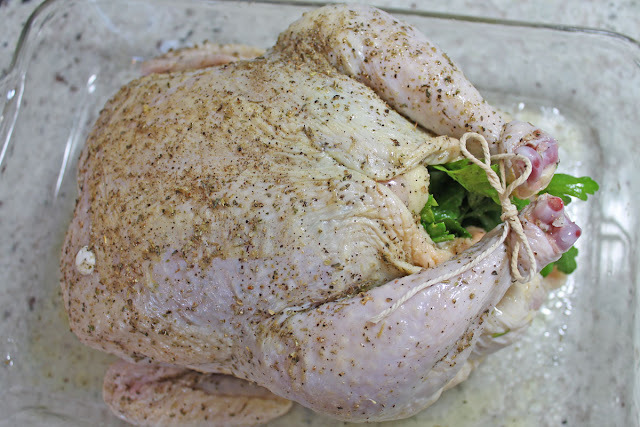 Select your favorite aromatic fruits, vegetables, and herbs to stuff in the cavity to flavor the chicken. Think oranges, lemons, carrots, celery, parsley, rosemary, onion, garlic...you get the idea. A good baster and digital thermometer will make your roasting easier and ensure success. These tools aren't absolutely necessary, but they do take some of the guesswork out of the picture. Tie the legs together with kitchen twine to keep them close to the breasts. This will help to ensure even roasting of the chicken and keep your legs from getting overcooked and dried out. Always let your roasted chicken rest for 15-20 minutes before carving it. You want to juices to settle down to keep the chicken moist. Remove the giblets. Rinse the chicken with cool water and pat it dry. Place the chicken in your roasting pan. Mix together the salt, pepper, Italian seasoning and garlic powder. Rub the olive oil all over the chicken. Season the inside of the chicken with approximately half of the seasoning mixture and stuff with the sprigs of parsley and rosemary. Now comes the key step. Run your fingers under the skin on the breast and legs to loosen. Spread approximately 1/2 tsp of the seasoning mixture under the loosened skin. Placing seasoning under the skin really makes a difference on the deliciousness scale. Rub the rest of the seasoning over the outside of the chicken. Tie the legs of the chicken together with kitchen twine. Place the chicken in the preheated oven and roast until the internal temperature is 185 degrees F. Baste the chicken occasionally while it roasts. Begin checking the internal temperature of the chicken after one hour. Cover the chicken with foil and let it rest for 15-20 minutes before serving.